1. The leptosome or slender type, tall and thin and long limbed, with a long, narrow trunk and correspondingly narrow shoulders and a long, narrow skull. 2. The athletic type with broad shoulders, a high solid skull, powerful trunk with large chest, firm abdominal muscles, little fat tissue, making the muscle contours clearly visible attached to large bones. The body has an overall wedge shape. 3. The pyknic or compact, thickset type, of medium height, with round skull, short neck, and a deep chest. A tendency to grow fat tissue inclines to make the muscle contours even out; the face is soft and plump and the body paunchy. This type loses its harmonious proportions if, through hunger or diet cures, an attempt is made to approximate it to an irrational ideal. Fundamental differences between the male, female, and child's body structures also exist alongside individual differences. The male body is generally used for the study of anatomy as it shows the bones and muscles most clearly. Male and female differences are to be explained through their difference in biological function, the male being more adapted to work and the female to the demands of reproduction - hence, for instance, the greater breadth of the female pelvis. This in turn causes a strong curve inwards of the upper leg bones, which is why women tend to be knock-kneed. The pronounced narrowing of the female waist is in part due to the broader pelvis and in part to its stronger turn forward. The female rib cage is generally longer, deeper, and narrower than the male, and more rounded off at the top. The shoulders drop correspondingly lower and tend to be more rounded and sloping; sometimes the neck, too, seems longer and more slender. On the female body the chest muscles are almost completely hidden by the breasts, which very enormously in shape with individuals. There is no biological nor aesthetic norm to be found for them. The canons of earlier times maintained that on the whole the female body is smaller and gentler, shorter legged and armed, and with proportionately smaller hands and feet. A comparison of earlier representations of the female body, until the latter half of the nineteenth century with photographs of modern sportswomen shows plainly how little these canons apply to the average modern woman. Rather do we see now that the proportions of the female body are not so different from those of the male, a reflection of the changed role which women play in social life. Sloping shoulders have become much rarer in women. A long leg is now the ideal of female beauty, and nowadays it is unusual to see such breadth of hip as used to be taken for normal in the old days. It is biologically impossible that the skeleton should have altered so much in a century; the change can be explained only by the social tendencies of the modern age: women now hold themselves more upright and walk with more freedom and self confidence. Muscle tone, influenced by these factors, can disguise much and make the anatomy seem very different from what it really is, implying that there is still some mysterious chameleon-like quality in us that can even alter the shape of our soft tissues. Sport and uninhibited movement in sun and air with a minimum of clothing have become as usual for girls as for boys, and thus girls, too, develop their muscles at the expense of the fat tissues. Some medical opinion attributes a tendency to greater stature directly to the influence of sunlight on the body, particularly in early childhood. 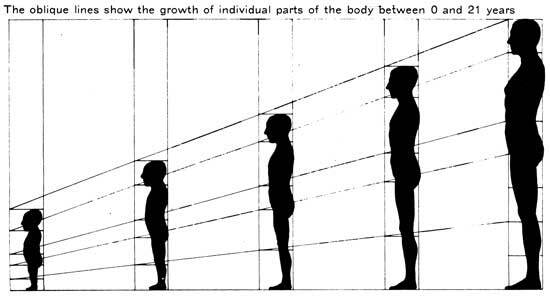 It can be seen from the diagram of physical growth from birth to maturity how different parts of the body grow at different rates. In linear measurement the head, for example, only increases from between a half and a third, whereas the shin is four times as long in a man as in a newborn baby. 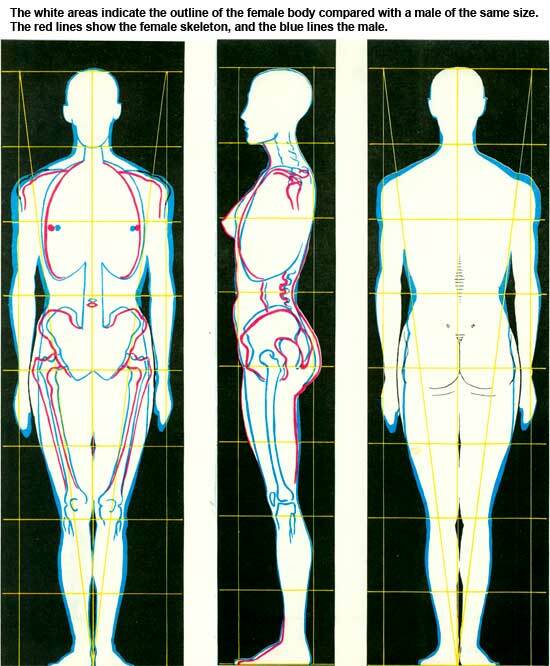 All the other parts of the body increase in different proportions within these extremes. The five stages illustrated are not taken at regular intervals of age. Generally, a person grows most quickly between the fourteenth and sixteenth years, and often reaches full stature during this period. It is clear how important it is to observe the characteristic proportions when drawing children. To make this review simpler, we have separated the anatomy of head, hands, and feet from the rest. Attempts have often been made to find scientific correlations between the shape of the skull, nose, and ear and the temperament or psychological characteristics of a person. The hand, too, has been studied in this light, and chiromancy even claims to read the individual's past and future fate from the lines on the palm. Science dismisses all these speculations; a sharp, aquiline nose reveals no more good of a person than a bulbous or flat one; an ear which according to our views is beautifully shaped is no more proof of musicality than one which has what looks like criminal characteristics. You should study the skeleton and superficial muscles in order to draw more accurate people.